Males have dorsal fins that are slightly more pointed and slightly orangeish-reddish pelvic fins. Water with a neutral pH, with the temperature being in the low 80's is ideal. The male will build a bubble nest, often with vegitation, and court a female under it. When this happens, the male will wrap himself around the female, causing her to release her eggs. Up to 2000 eggs can be produced per spawn. When eggs hatch, feed the young live baby brine shrimp, or daphnia. Do not house with aggressive fish, the Gourami will not feed properly and may starve. Do not house with fin nippers such as Tiger Barbs or Serpae Tetras. Keep with peaceful fish such as Corydoras. Do not keep two male Gouramis in a tank as they will fight. Omnivore. Will readily accept flakes, frozen foods, such as brine shrimp, bloodworms, and krill, as well as live foods. Be sure to feed a varied diet. Keep in a spacious and mature tank. Will not appreciate very fast flowing water. Would be happy in a planted tank. Blue-silver is present across the fish body. Younger fish have a black spot on the tail. The head of this gourami is depressed right before the snout. Like other anabantoids, the moonlight gourami has a special "labyrinth organ" that allows it to take oxygen directly from the air. 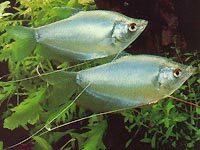 If a moonlight ourami, or any other anabantid fish (betas, gouramis, and paradise fish) is taking most of its air from the surface, it may mean that the water is oxygen poor. Due to its ability to breathe air, anabantids, if kept moist, can survive for a while without water.